NORTH LITTLE ROCK, Ark. 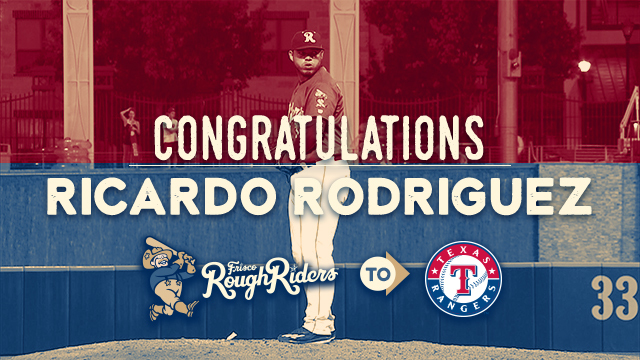 (August 8, 2017) - The Texas Rangers announced Tuesday that Frisco RoughRiders relief pitcher Ricardo Rodriguez has had his contract purchased by the club and been promoted straight to the Major Leagues. Rodriguez, 24, is in the midst of a stellar season between the RoughRiders, Texas' Double-A affiliate, and Advanced-A Down East. In 35 outings, he's 5-1 with a 1.34 ERA and has converted all 17 of his save chances. He has only permitted runs in three of his 35 appearances this season. The righty gained notoriety throughout the farm system when he retired 45 consecutive batters in a 12-outing span with Down East from May 14-June 28. He leaves Frisco having allowed two runs in 15 innings, including 11 1/3 consecutive scoreless frames to close out his time with the squad. Rodriguez will be seeking his Major League debut with the Rangers. He would become the 138th former Riders player to reach the Major Leagues. The RoughRiders open a six-game road trip tonight at 7:10 p.m. against the Arkansas Travelers. The Riders return to Dr Pepper Ballpark next Tuesday, August 15, for a six-game homestand against Arkansas and Northwest Arkansas. For tickets to all remaining home games, click here, call (972) 731-9200, or stop by the RoughRiders Ticket Office at Dr Pepper Ballpark. The Frisco RoughRiders are the Double-A affiliate of the Texas Rangers and play their games at beautiful Dr Pepper Ballpark in Frisco, Texas. The team was founded in 2003 and has finished first among all Double-A franchises in attendance in each of the last 12 seasons (2005-2016). In August 2014, the RoughRiders were purchased by an ownership group led by Chuck Greenberg. The new ownership group, together with the city of Frisco, has spearheaded numerous major franchise improvements over the past two seasons, investing more than $8 million in a wide array of facility upgrades and improvements, including a new state-of-the-art HD video board, sound system, Bull Moose Saloon, InTouch Grille, Riders Outpost Team Store, and the newest and biggest creation, the 174-foot Choctaw Lazy River. The upgrades made prior to the 2015 season earned the Riders and the City of Frisco "Best Ballpark Renovation" of 2015 by Ballpark Digest. The same publication also honored the Choctaw Lazy River as the best ballpark improvement over $1 million for the 2016 season. More than 130 former RoughRiders players have gone on to play Major League Baseball, including All-Stars Chris Davis, Adrian Gonzalez, Ian Kinsler, and Nelson Cruz, as well as current Rangers stars Elvis Andrus, Rougned Odor, and Nomar Mazara. For more information on the Frisco RoughRiders and Dr Pepper Ballpark, please visit RidersBaseball.com or contact Art Garcia at AGarcia@RidersBaseball.com or Ryan Rouillard at RRouillard@RidersBaseball.com.